Developers at Hitpoint have done it again! 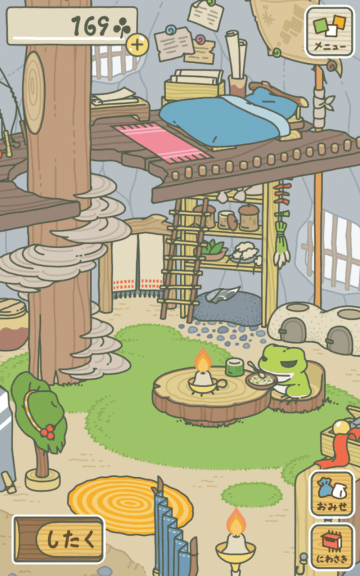 They have created another adorable game, but this time the game’s not about kitties but a cute travel loving amphibian. Sounds interesting, doesn’t it? Well, Tabikaeru or Travel Frog is about a lonely frog who loves traveling. What you have to do is help him travel to various places by performing simple tasks. In return, he will send a photo and some cool souvenirs. The game’s all about collecting various mementoes and travel postcards from your friend. The real-time nature of the game is much like Neko Atsume, and this is probably why it can be very addicting despite its slow pace. 1. Collect clovers from the field outside your frog’s house. Just swipe to collect them. They are used to buy items for your frog. If you are inside the house, then you will have to tap the letterbox icon on the lower-right corner of the screen to go outside. Clovers appear slowly so if you want lots of them, so you will need to open the app every 6-12 hours. You may also get clovers as gift in your mailbox daily. You can get up to 500 clovers. Use them wisely and spend them on food and other items that are crucial for trips. 2. 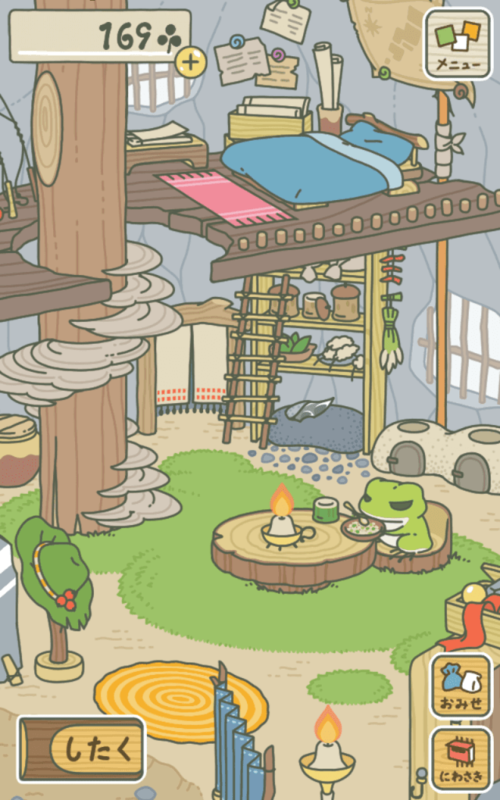 Tap the house icon to go to your frog’s home. He will be busy reading a book, writing something, sharpening a wooden tool or just eating a sumptuous meal. While your frog is at home relaxing, you can pack some lunch and other key items before he travels to a foreign land. But you will have to purchase food before doing anything else. Tap the shop icon on the lower right corner of the screen and purchase meals for your traveler friend. Start by purchasing the cheapest food and when you have enough clovers, you can buy pricey meals. You can also buy other necessary things such as towels and tents (See screenshot). 3. You can check the items you have bought by tapping the three-square icon on the upper-right corner of the screen and then tapping the green shopping bag icon. The first tab shows all food items you have purchased so far. The second tab displays travel-related items such as lanterns, towels and tents. If you tap the third tab, you will see all lucky clovers you have collected so far. Tapping the fourth tab shows all souvenirs brought by your frog. 4. Before the frog leaves the house. Pack something for him. For starters, 1-2 meals, towels/tents and that lucky 4-leaf clover would suffice. For more on how to pack food and other items, refer section 3 of this guide. You can do this any time; just make sure your frog is at home. 5. Your Kaeru (frog) can travel any time of the day, without informing you. If you see an empty home, it surely means he has gone for a long trip and it may take hours before he returns home. Well, you don’t have to worry because you will get a notification on your android device when he comes back. 6. When your frog reaches home, he brings some souvenirs and a beautiful photo (featuring him and other creatures) of the place he recently visited. You can keep all photos in a separate album or share them with your friends. Trip snaps are stored a photo album located at the top-right corner of the screen – just tap the three-square icon and then tap the middle button to access photos and souvenirs bought by him. 7. Along with photos/souvenirs, you also get a chance to receive a ticket and a few clovers. Collect five tickets and then head straight to lottery section, where you might get cool prizes. Tap the shop icon and then tap the bell icon on the upper-right corner of the screen. You will need 5 tickets to activate the machine. To get a list of prizes, tap the yellow button. When you have enough tickets, tap the big white button to get a random prize. Outside your Kaeru’s home you will see a small field. This is where clover grows over time. Keep visiting the field and swipe clovers to harvest them. You might get a rare 4-leaf clover while harvesting. This is called “Yotsuba” clover and it can be used as a lucky charm to help protect your frog while he travels across the world. You might also get this type of clover from a visitor. When the visitor leaves, he will give a ticket and a common or rare clover. Check your mailbox located next to your frog’s house. Common 3-leaf clovers are called Mitsuha and you will get several of them from the field. You can use them to purchase lunch, tent and other travel-related items for your frog. Also don’t forget to look into the mailbox every day. 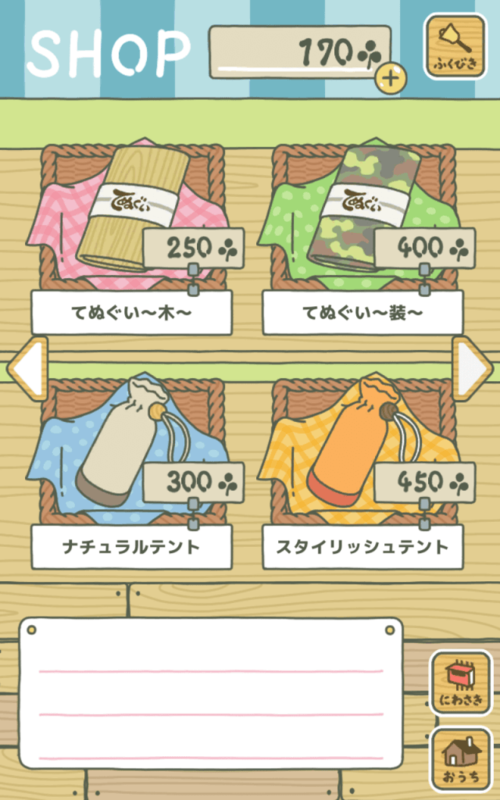 To purchase items, tap the blue-white shopping bags on the lower-right corner of the screen to access the shop. 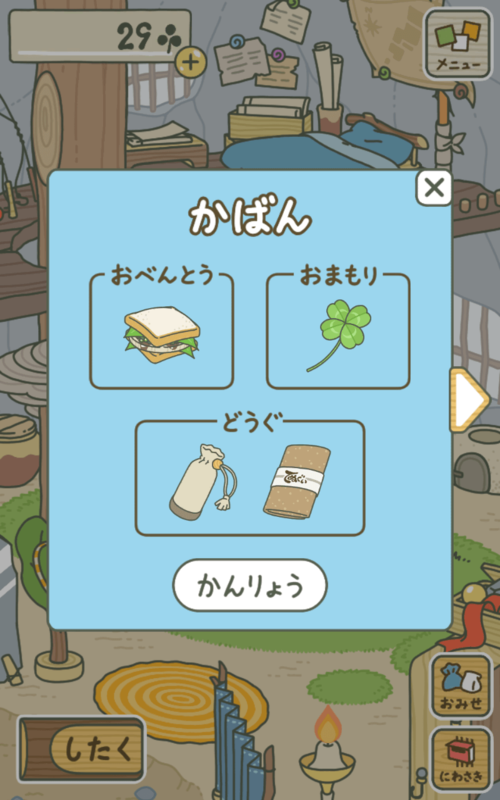 You can purchase sandwiches and other items using common clovers. The number of clovers required to purchase one is shown in the lower-right corner below each item. You can also buy tents, towels, lamps and bowl and then pack them up before he leaves his home. 2. Are There Any Use of Lucky Charms? According to this game, the four-leaf clover called “Yotsuba” acts as a talisman and brings luck. In the tutorial mode, the game allowed you to add this clover when the frog was packing bags. Now we don’t know what the actual use of Yotsuba is. Personally, I feel adding this clover to your frog’s backpack will protect him on his trip to foreign lands and may also bring some rare souvenir from a country. Now this is just conjecture and I would really love to hear your opinion on this. Just keep experimenting by adding different types of items, including food along with the lucky charm before your frog leaves his home and see what he brings back from his trip. 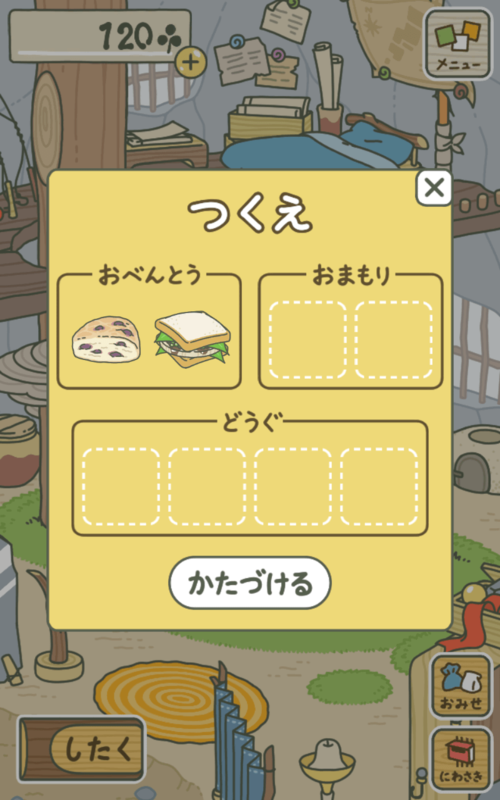 To pack lunch and other items for your Kaeru, tap the wooden log on the lower-left corner of the screen. In the short tutorial, you may have noticed your frog packing bags before going for a trip. This is when you packed a lunch and a lucky clover before he left his house to travel abroad. Well, you don’t have to wait for your frog to pack his bags. You can just reserve food and other stuff hours before he leaves the house. Go inside your frog’s home, tap the wooden log. On the blue window, select the food item you have recently purchased. You may also select additional items, such as lucky clover (can be added to the empty slot on the right side), tent or towels (can be added to the two empty slots on the bottom). Next, tap the “X” button to close or press the white button to lock these items and your frog will take them with him on his next trip. You can do this anytime, but make sure you stock them. Harvest as many clovers as you can and use them to buy necessary items. 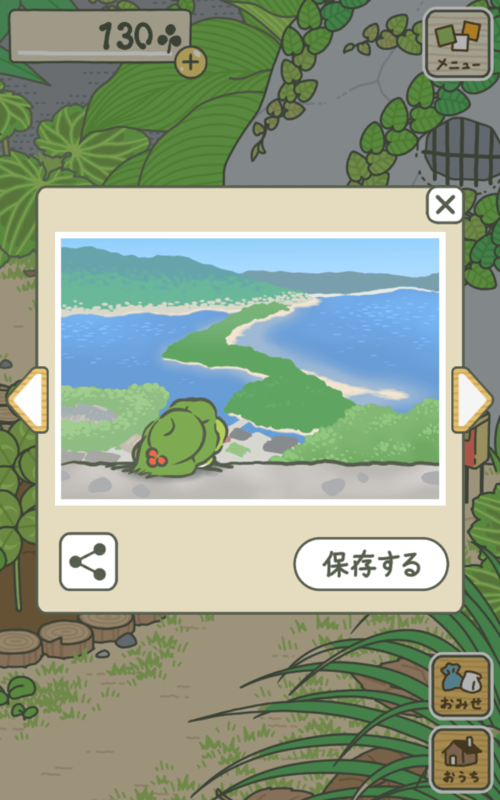 When your frog does not come back, you may have noticed an exclamation mark appear just above the brown wooden log on the lower-left corner of the screen. Just tap it and a yellow window will pop up. Tap the first slot and add food (you will have to buy food before adding it). Now press “X” button on the upper-right corner to close the window. Your frog will be back after a few hours. The time of his arrival after adding food is not known, but you can be assured that he will be back home. This cheat is pretty popular and it works in this game. After your frog leaves his home, minimize your game, go to “Settings” on your Android device, tap Date/Time and turn off “Automatic date/time”. Now set the time at least 5-6 hours ahead and open the app again. Your frog might be back from his trip, and if he isn’t you can go back to settings and set the time ahead by 2-3 hours more. I once changed my date 2 days ahead and got three pics and a few souvenirs. However, when you turn on “Automatic date/time” again, the game freezes and does not move ahead. This is one big drawback of this trick, which is why I won’t recommend using it (plus it ruins the fun). The game was developed keeping in mind the day-to-day activities of your pet frog. The randomness and the real-time nature of Tabikaeru makes it even more exciting and so using this cheat spoils everything about this game. There are risks of app freezing and the game just stops progressing. It just kills the fun! You may have to reinstall the game again, thereby losing all progress and rewards you have earned so far. Also, developers may totally fix this bug in later versions, so you may not be able to use this cheat in future. Hi does anyone know how to recover a photo deleted by error please? I saved it in the app album and accidentally deleted it. 🙁 Thanks in advance! How do I add on more pages as all 10 pages are full.. I would like to keep all the pictures. Currently there is no way to add more pages to your album. You can delete duplicate pictures, keep your favorite pics or save them to your smartphone. My cousin’s frog does not come back home for more than a month. I have placed food on the table, but still have exclamation mark. How To fix it? Will the frog die? Yep, that’s true, which is why I have already warned readers not to use the time-lapse cheat. Are all ten album pages full? Or have you accidentally deleted a photo? I forgot to save this to the album 🙁 I guess it cannot be taken back. First off, I am totally new to the game, but I have one advantage, I can read Japanese (not a native speaker). These tips were super helpful, so thank you very much! Section 4 (4. What Should You Do If Your Frog Does Not Come Back) is about where the frog does not come back home, right? The box title reads tsukue (=table). So when I read the instructions for the game, what I understood is that when your kaeru is not home, you can leave food (obentou), charms (omamori) and tools (dougu) on the table. The frog (kaeru) will pack these items in his bag when he leaves. This way, you don’t always have to worry about packing his bag and you can be sure that he will come back sooner or later. I think you are absolutely right. Thanks for helping out.